Construction has started in Bulwell to build 13 new council houses which will provide new homes for local families. Nottingham City Homes (NCH) and contractor Woodhead Group will develop the homes on Aldgate Close in Bulwell, which will be built on the derelict site of a former care home on behalf of Nottingham City Council. The two, three and four bedroom family homes, which will be built to high energy efficiency standards and offer warm, secure and affordable modern homes, will go to Nottingham families on the City Council’s waiting list. Contractors are now on site and ground works have begun, with the new builds going up in spring. The work is expected to be completed this winter. These new homes are the latest of the Building a Better Nottingham developments in the north of the city, after planning permission was approved last year. 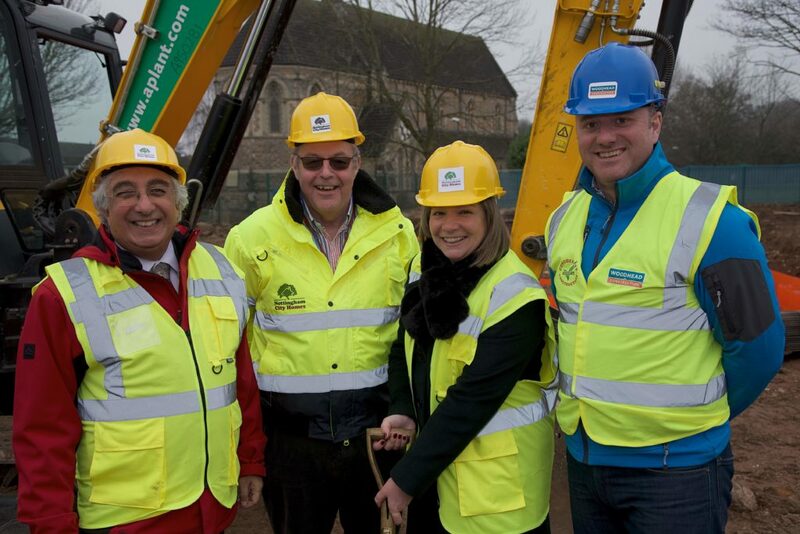 NCH and contractors Woodhead Group joined Nottingham City Council’s Portfolio Holder for Housing and Planning Cllr Linda Woodings and local ward councilors to mark the start of construction with a ceremonial ground-breaking. So far NCH has built more than 500 new council homes for local people, and is expected to work on nearly 100 more this year. Nick Murphy, Chief Executive for Nottingham City Homes, said: “This year we are celebrating 100 years of social housing and the first new homes in Aldgate Close will be completed during this celebration year. “2019 marks the centenary of the Housing and Planning Act (1919). The Act made housing a national responsibility, and for the first time councils were given the task of developing good quality new housing where it was needed for working people. A hundred years later this is still the vision of NCH, we want to build warm and secure family homes that the people of Nottingham can afford to live in and these new properties will be no exception”. Cllr Linda Woodings, Portfolio Holder for Planning and Housing at Nottingham City Council, said: “Working with Nottingham City Homes and partners, we’re transforming Nottingham’s neighbourhoods and regenerating sites which are no longer fit for purpose and replacing them with warm, safe and quality new homes. “Together we’re Building a Better Nottingham by developing a mix of much needed properties across the whole city, from family housing to bungalows and independent living schemes which meet the needs of local people in Nottingham”.